Heat the butter in a large soup pot over medium-high heat. Add the tasso, sauté until lightly browned, about 3 to 5 minutes. Add the celery and onion, and sauté until soft, about 5 to 7 minutes. Add the green onions, parsley, and garlic. Reduce heat to medium-low, stir in the filé, oregano, and Cajun seasoning. Add the collard greens, mustard greens, and spinach. Add 1 cup of the chicken broth and stir to coat. Cover and cook until all greens are tender, stirring occasionally, about 15 minutes. Purée the mixture in a food processor and set aside. Heat the oil over medium-high heat in the same soup pot and add the flour, whisk until smooth. Continue to cook, whisking constantly, until the mixture turns light brown, about 10 minutes. Whisk in the remaining 2 cups of broth and bring to boil, whisking often. Add the green purée and simmer for 15 minutes. Add the crawfish tails and season to taste with salt and pepper. Editor’s note: In our gumbo that is pictured, we skipped the purée steps to give the gumbo a chunkier texture. 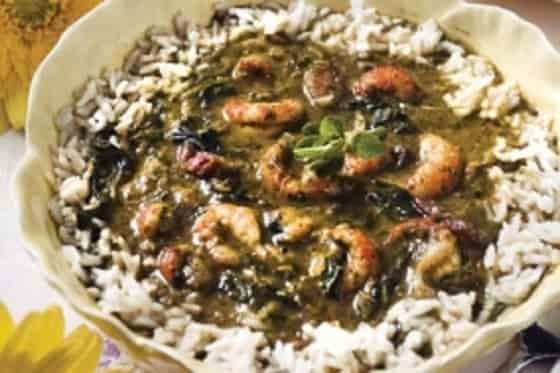 Recipe and photo courtesy of Louisiana Seafood and Marketing Board, and Wynton Marsalis. Used with permission.